Disclaimer: Blue Diamond provided almonds for use in this blog post. The opinions stated in this blog post are the unbiased opinions of its author. I’ll let you in on a little secret if you promise not to shame me for it. Part of why I like to work out is because I like workout recovery food. I do heavy weightlifting (I’ve been lifting since I had surgery 6.5 years ago) and one day was speaking to my trainer and asked what’s a good thing to eat after a heavy lifting session. She advised me that something with some good carbs, protein and some fat is the best combo and suggested some lowfat yogurt with some fruit. I had a strong peanut butter craving. I’d just done a REALLY strenuous lift session (new routine and I bumped my weights up). This post-workout mini-meal was the result. Now I usually don’t eat before I go to my lifting class (it’s at 5:45 a.m. and I don’t care how agreeable my pouch is, it’s not accepting food that early!) so it’s essential I get something good in me once I get home. This was fast, easy and yummy! I call it a PB&B for peanut butter and blueberries, of course. In my former life I loved blueberry jam on a peanut butter sandwich, so I decided to play with my food and see if the flavor could work in a yogurt set-up. 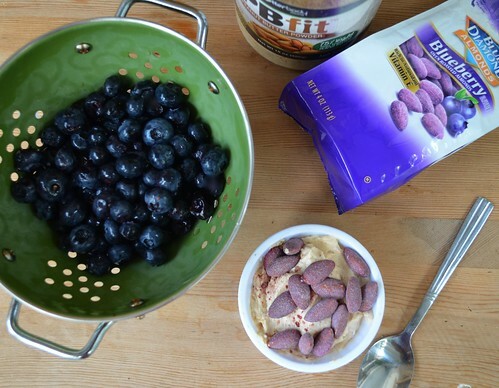 In a bowl, mix together yogurt, sweetener and peanut butter powder. 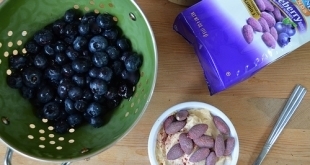 Blue Diamond offers a variety of flavored almonds that you can use in a variety of ways. I must admit I was skeptical about the blueberry almonds (I’m skeptical about almost any kind of blueberry-flavored anything), but I really did enjoy them. They were lightly sweet and crunchy. A nice offset to my peanut butter yogurt. Now, if you’ll excuse me I’m going to use my current post-workout endorphin high to knock out some laundry. Keep playing with your food!